A couple of weeks ago I was at Michael's, and that day they had a 60% off one item coupon on the website. I was looking at Impecable Big! yarn by Loops&Threads, which is sold for $10 a skein. But by some reason, the red one was on clearance for $4. And I used my coupon for the white one. So the total cost of yarn came to $8, plus sales tax. That's awesome for two big skeins, which I then used to make this lapghan. I worked with a hook size I/9 (5.5 mm). It only took about a week to make this lapghan. I love how pointy the edges are. I'm think fringe would look great on them. But I actually very much dislike making fringe. Such a tedious and boring work! The finished size is about 54 by 34 inches. 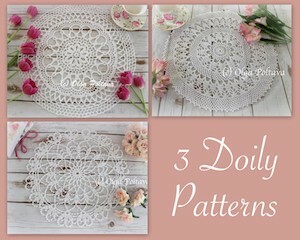 The pattern is quiet easy, and can be adjusted to different sizes. 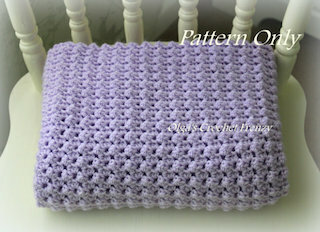 The pattern is available in my Etsy and Craftsy shops, as well as on Ravelry. This is the second blanket that I was commissioned to make. I love the way it turned out! It looks simple, yet beautiful! 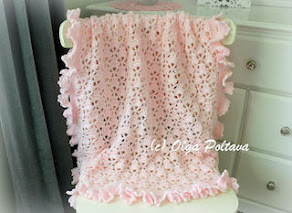 I used Snuggly Wuggly yarn in ivory color and a size G/6 (4.25 mm) hook. The pattern is from my Etsy shop. I already mailed the blankets to the lady who commissioned them and she was happy with my work. She wrote: "Thank you for helping me out and making them for me. God Bless you. I will keep in touch for other blankets." It's such an amazing feeling when people like and appreciate your work. Feels great! I often get emails or messages through my Etsy shop from people asking whether I take crochet commissions. Most of the time I don't. I always have so many crochet (and now knitting!) projects of my own, that I can hardly find time for commissions. In addition, I've had some negative experiences in the past when the commissioner would just disappear. Someone contacted me recently, and I was really moved to help this lady. It turned out she used to live in my city though now she lives in a different state. She needs two baby blankets for her friends' babies. And I absolutely love working on baby items. 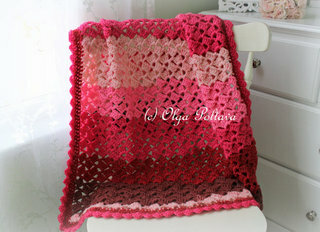 There is just something very special and heartwarming about crocheting for new little angels. She was also very kind to pay me upfront, which any crocheter who takes commissions greatly appreciates. So this is the first set that I made! 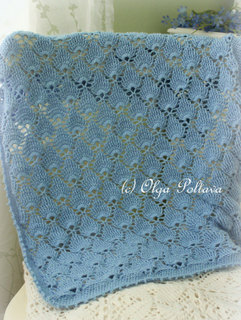 Those of you who follow my blog would probably recognize the Lacy Baby Blanket pattern. 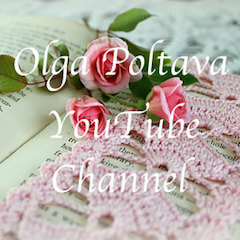 It is the most popular pattern on my blog. And it also was the very first pattern that started me on my pattern writing path! 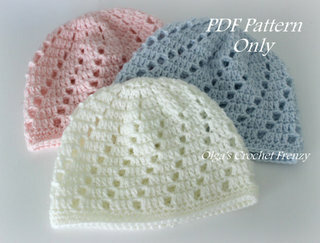 The pattern for the matching hat in size 3-6 months is also available free on my blog. 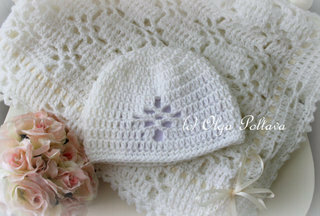 And I also have the pattern for the same hat in size 0-3 months. But you will notice that I made a different edging both on the blanket and the hat (my customer wanted a ruffled border). I don't have a written pattern for that, but this link could be useful. The yarn I used was Snuggly Wuggly by Loops & Threads, which is one of my favorite yarns for baby blankets. 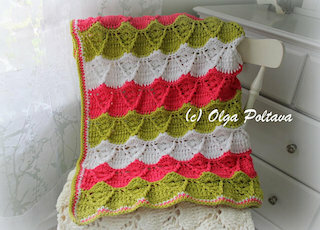 I used size E/4 (3.5 mm) hook for the blanket. For the trim I used a bigger, size G/6 (4.25 mm) hook as I wanted it to be very light and airy. I am now working on the second blanket! This leaves vine edging looks complicated, but in reality there are only two repeating rows. 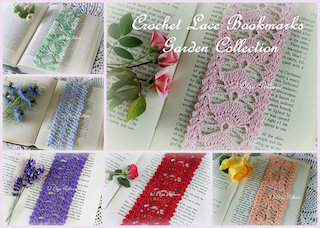 I used size ten crochet cotton thread and a steel hook 1.25 mm. The width of the finished piece is about 2.5 inches, but the length can vary. 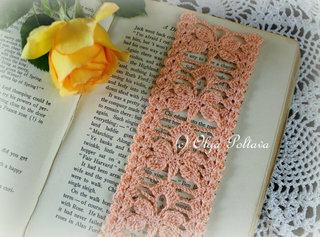 If you make it about 8 inches long, you'll have a lovely bookmark! Or you can make it any other length and use as a trim for other craft projects. I'm thinking if done with yarn, this can even be a scarf! 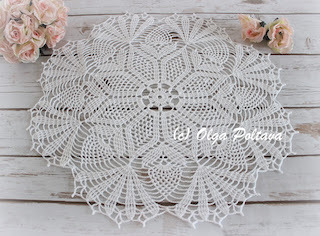 This is a quick post regarding the Coats and Clark Hearts doily pattern. 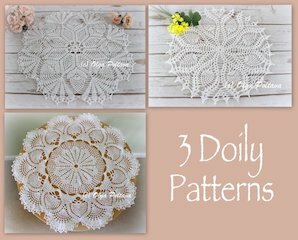 The other day I got an email from someone asking about the pattern for this doily. 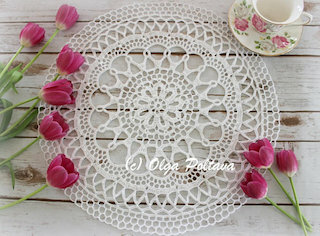 I believe it is THIS doily the lady asked about. 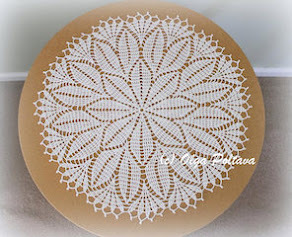 So yes, I believe it was this doily the lady asked me about. She mentioned that the link to the free pattern on the Coats and Clark website no longer works. She asked me if I have the pattern saved on my computer. And as a matter of fact I do. I hope she will see this post and contact me again.